This month we had another BlogPaws adventure. Up, up, and away we flew! We were on our way to Las Vegas! We went to the "strip" for a few days before BlogPaws officially started. There was so much to see and sniff. I had fun riding around Las Vegas in my new travel stroller that Mom ordered from Nip and Bones. They shipped it to the hotel so I didn't have to bring it on the airplane. I saw a fountain show inside a mall, cruised by a petite Eiffle Tower (Paris casino), and slept in a castle (Excalibur casino). 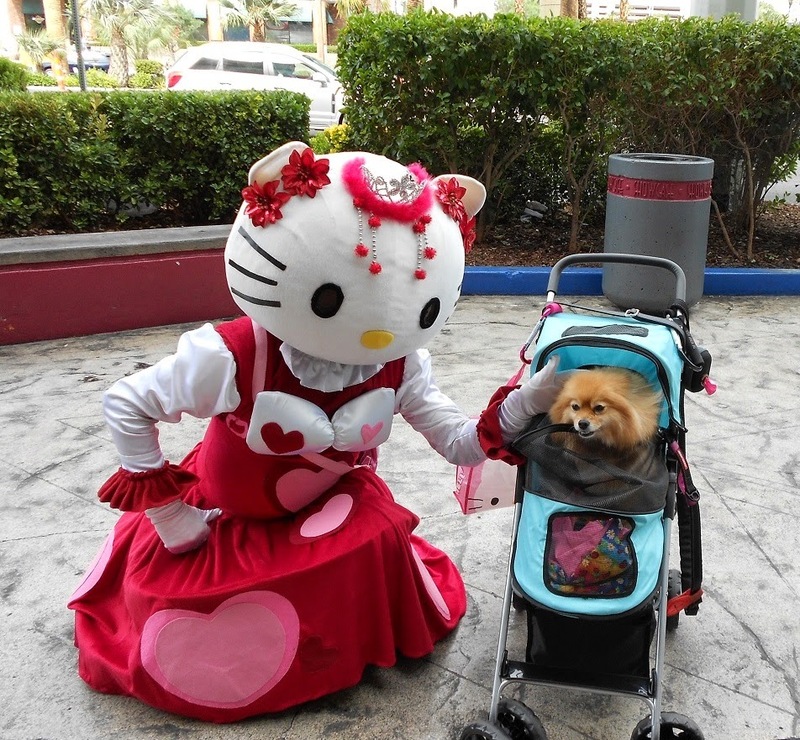 While we were exploring the "strip", I met a new kitty pal called Hello Kitty. I rode the world's tallest wheel, called the High Roller. It kept changing colors, and I am happy to say one of the colors was pink! BOL! I found a little dog park behind the Flamingo casino. I also found a dog friendly souvenir shop inside the Flamingo, and I borrowed Mom's plastic to go shopping. I bought a little bed, a rolling carrier, and a pink flamingo squeaky. I named the squeaky " 'Mingo". Mom thought the carrier I chose would be too small, but I climbed in to show her I could fit, then I refused to get out until she bought it for me. BOL! Then it was time to move to the BlogPaws hotel (Westin). It was pawgeous! My pal Herman's (@Tattlecat) people gave Mom and I ride to the BlogPaws hotel. The next day I was happy to say hello (bark) to some good (yummy & fun) pals. Why yes, I would love to take a treat from you. 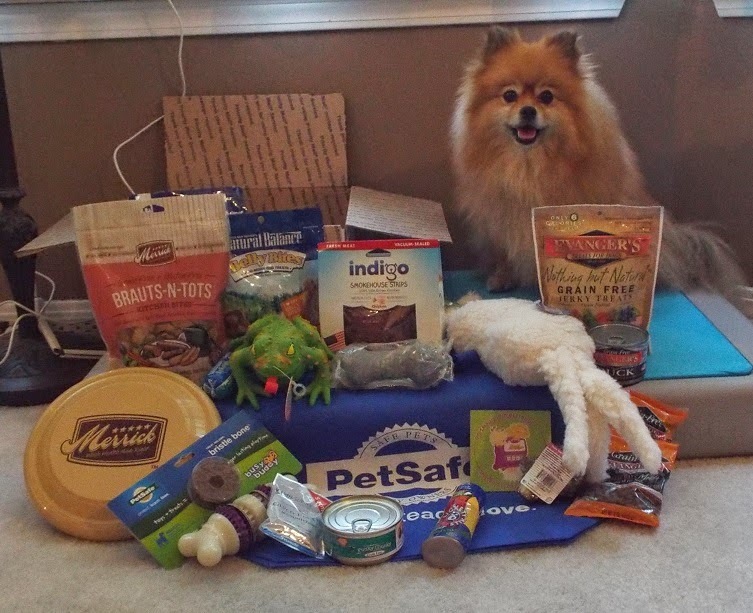 Thank you PetSafe, Merrick, and all the pawsome sponsors I sniffed & sampled. I watched my pal Lorie Huston, DVM receive an award from the BlogPaws staff. Congratulations Lorie! 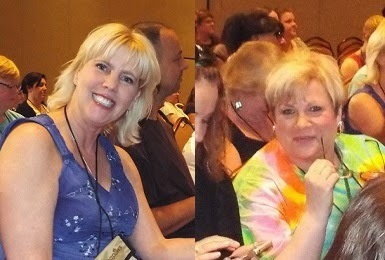 My furrific pals Lisa and Caren were there as BlogPaws Ambassadors to answer questions anyone might ask. It was fun to see several furry pals zooming around in strollers like me. I met a #PetChat pal from the land down under, @DogDancingGuy. Herman's stroller had a pawsome banner with his blog URL (wonderpurr.com) on it. I also met some adorable little Poms, Jack & Isabella. Gretel was part of the stroller brigade too. I was very comfortable in my pink Pet-A-Roo from Outward Hound by Kyjen. (Future review). I posed next to a few booths while I was relaxing in my Pet-A-Roo: Merrick & Jones Natural Chews. I enjoyed some playtime with other small dogs and their humans in the dog daycare sponsored by PetSafe. Sometimes nothing feels better than a good wiggle roll! Don't forget to nominate your city in PetSafe's Bark for Your Park contest! You could win a new dog park for your city. You have until June 7, 2014 to nominate your city. I enjoyed seeing Sugar again, and sniffing some new furry pals like Winston the white Corgi. Of course, I am always happy to see familiar faces in flat pet form, including a new flat pal - Bentley. I also met a Capybara named Mia, and a blind poodle wearing a new invention called "Muffin's Halo" to prevent her from bumping into walls. I was thrilled to walk the red carpet with my "twin" Cute Sophia Loren while wearing our matching couture gowns from PetMonarchy. PetMonarchy designs such beautiful pet fashions. Sophia's and my red carpet dresses featured a hand-beaded double train that was trimmed with beaded tassels. These shimmering golden dresses were decorated with the BlogPaws logo and color scheme for this special event. At the pawty, I posed for a photo with #PetChat pal Dr. Anna, and woofed Dino (founder of Triberr) into modeling a tiara with Renee (Marvelous Products). BlogPaws wouldn't be the same without pawsome pals like my roommate, Emmy the Pet Sitter and @Tildatoo. It was great to see plush @CathyKeisha, @GeorgetheDuck, Flat Edna, and Flat Carma Poodale. I wish they could have all been here in pawson. Emmy took all of us on a fun adventure on the way back to my castle hotel. We had some airline trouble, so the trip home was very ruff. 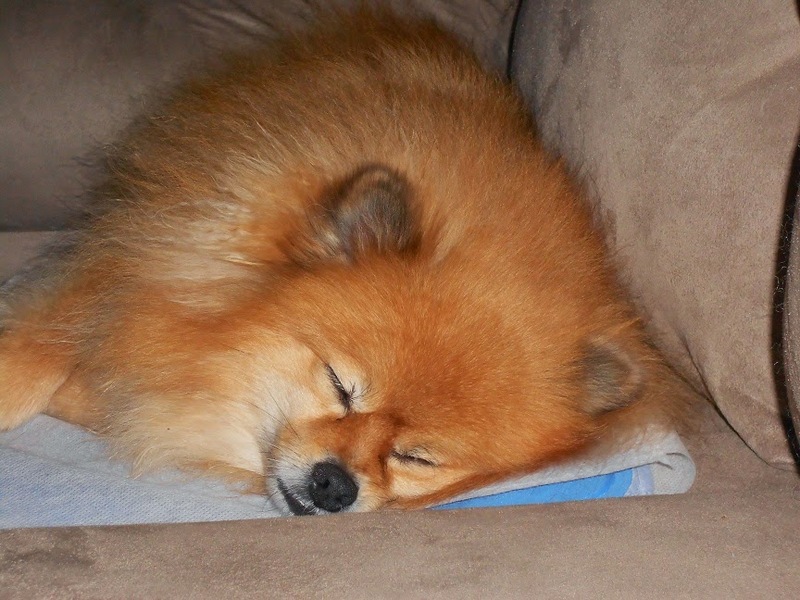 I was exhausted by the time I finally got home. On Friday, all of the swag I shipped to myself arrived. You know what that means.....Giveaway time! Here is a photo of the items I collected for the kitty swag prize. All of the items in this photo are part of the dog swag prize, along with whatever else I can fit in a large flat-rate mailing box. BOL! Login to the Rafflecopter and tell me which prize you are entering for! 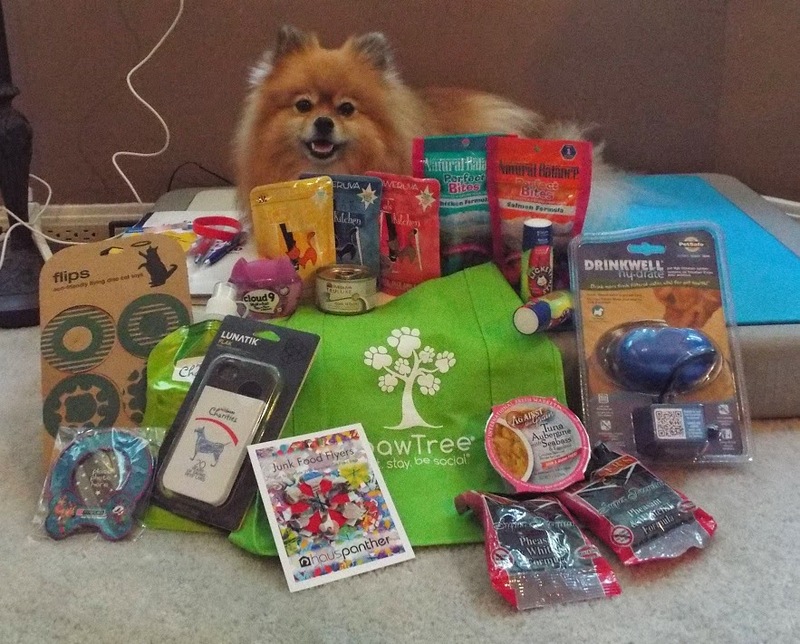 Thank you to all of the BlogPaws sponsors and staff members. I had a pawsome time! Giveaway Disclosure: I did not receive any monetary compensation for this giveaway. I was given extra swag to giveaway. I am not responsible for lost/missing prizes. The opinions in this giveaway are my own and not influenced by any outsider. 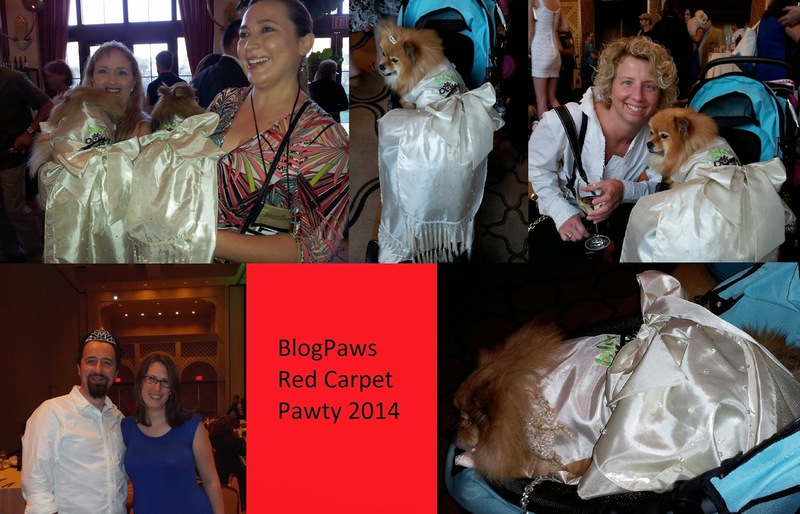 Pawsome BlogPaws wrap up Pepper! Mom was thrilled to see you and your mom again. Maybe someday I'll get to be there in the fur! Sure looks like you had one PAWSOME time Pepper!! You are one lucky doggie! Pepper...you look absolutely GORGEOUS in your gown from PetMonarchy! They are so talented...the gown is beautiful. You met up with some great pals too. 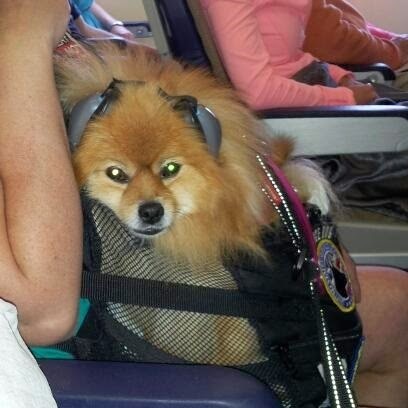 What an adventure you had traveling to and from Las Vegas for BlogPaws this year. Ma already bought her ticket for Nashville...we have got to get her to a BP Conference! What a pawrific post!! Your photo of the hotel was TOTALLY PAWESOME!!!! 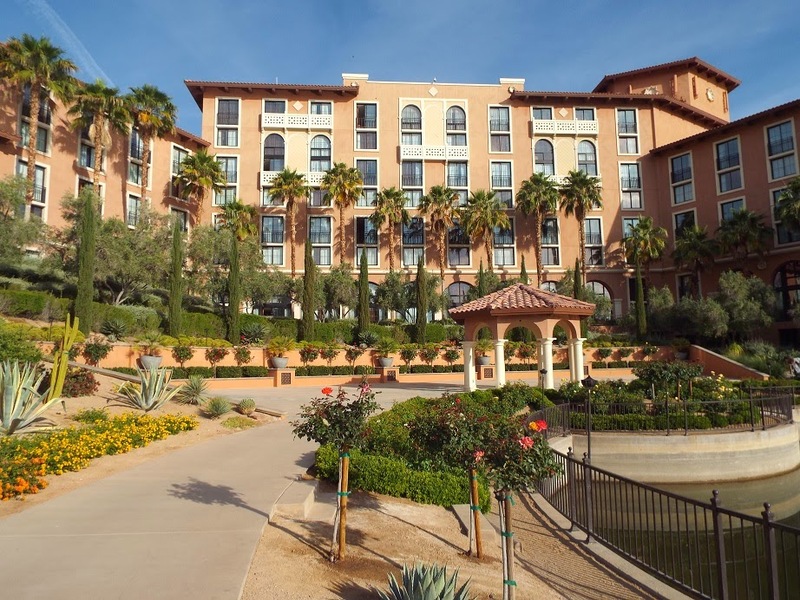 It was a FANTASTIC conference and the hotel was beyond beautiful! I don't even remember you taking that photo! What a PAWSOME prize for you to offer! We would LOVE the Dog Swag if we are selected! What a PAWSOME prize you are offering! If we are selected we would LOVE the Dog Swag! We would love to attend BlogPaws one day! I had such a great time at Blogpaws...but the best part was meeting you and your mom. I'm still in awe of all the swag we brought home. A lot of it has been passed on to needy kittehs. Have a pawsome day! You looked gorgeous in your red carpet gown! Very beautiful! 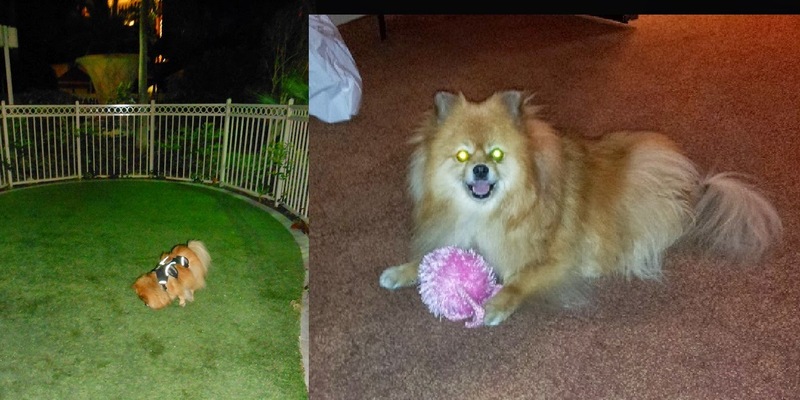 Glad you had a blast at Blogpaws :) Love the pics! I would love to be entered for the dog swag prize please. I'm entering for the Kitty Prize . my little sweetheart would love a swag bag of goodies! I am entering for the dog prize. Love the BlogPaws wrap up! I can't wait to go next year! As I ha ve five rescued Treeing Walker Coonhounds AND three rescued cats, picking for just dog or cat is hard. They would all love everything in the prize packages. I was lucky enough to win a dog PetBox a couple of months ago, so I'm going to go with the cat prize for this giveaway. I would love the dog prize, with two dogs, I know my boys would love this! I would like the dog prize.